DID YOU KNOW? — Prolonged exposure to the sun's UV rays without proper protection can cause permanent damages such as premature skin aging, wrinkles and freckles, as well as, various skin damages like discoloration, sallowness, dryness. In extreme cases, it can also lead to skin cancer. The most damaging UV rays are known as UVA and UVB. UVA rays penetrate into the deeper layers of our skin and are also the dominant tanning ray. The penetrative ability of UVA rays through glass means that even when you are seeking shelter indoors, your skin continues to be exposed to its harmful effects which can cause cumulative damage such as wrinkling and skin aging. While UVB rays cause the most damage to the outer layer of skin such as reddening of skin and sunburns. Without proper protection, prolonged exposure to UVB rays can cause long-term damage to skin's epidermal layers. Apart from UVA and UVB rays, pollution particles are also environmental aggressors that can wreak havoc to your skin. Since it's impossible to avoid the sun, the use of sunscreen is one way to reduce the danger of sun exposure. Hence, it's a MUST to slather on sunscreen before heading out to protect your skin! 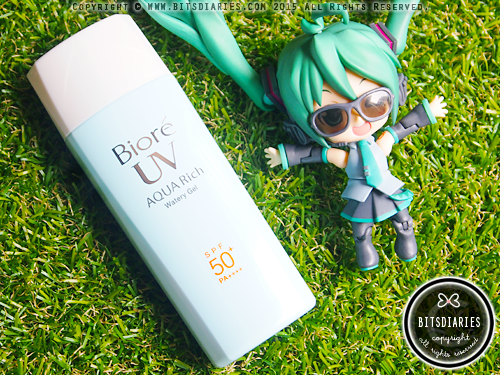 However, most of the women in Singapore do not consider protection against UV damage a priority. Based on the 2014 Benchmark Survey commissioned by Kao Singapore, only 30% of women use a sunscreen daily and for the past five years, the results remained unchanged. That means there are 70% of women don't use a sunscreen, and the top reason why women skip sunscreen is because the sticky, greasy feeling on skin that most sunscreens tend to leave behind. So this year, Biore aims to change that. Biore has introduced its complete range of NEW and ENHANCED sunscreen products, offerings the highest level of UV protection — SPF50+ and PA++++ rating (previously PA+++)! 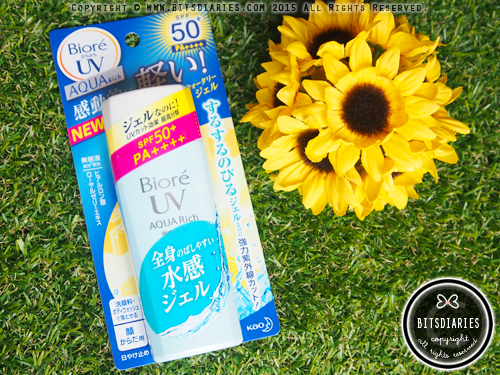 Aside from that, Biore has also launched its newest addition to the range that promises to have a lightweight and watery formula — UV Aqua Rich Watery Gel SPF 50+ PA++++, which I will be sharing about today. It comes in a soft, squeezable bottle with a twist-off cap. Using the same Aqua Rich Technology found in the Biore's popular UV Aqua Watery Essence, this provides the same lightweight and watery texture that allows smooth application without leaving a greasy or sticky feel. 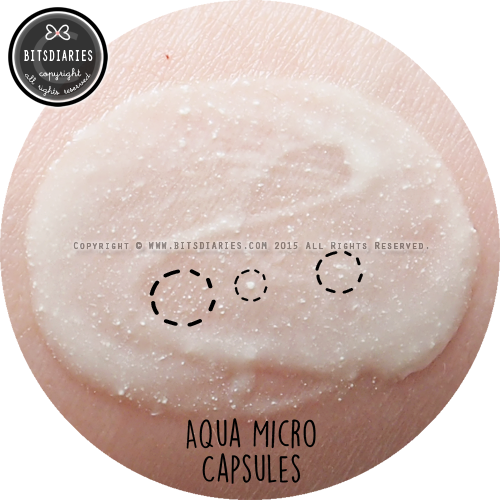 Plus, it contains unique Aqua Micro Capsules — each water capsule breaks upon application on skin to release the UV protection agent and moisture while giving skin a cool and refreshed feel. What's more, it is a superior double UV block with enhanced SPF50+ PA++++ (the highest level of UV protection) provides your skin a maximum protection against harmful UVA and UVB rays from head to toe! Usage: As the last step in your skincare regime, apply sufficient amount and spread evenly over the face and down to the neck. Ideal for use as a makeup base. Suitable for application on the body too! So this is my virgin experience with a watery gel sunscreen. The main reason why I skip/don't use sunscreen is because I fear it will trigger breakouts. Well, I have acne-prone skin; and most sunscreens in the market have a high SPF value, but they have a thick consistency that feel heavy and greasy, which may clog the pores and lead to acne. 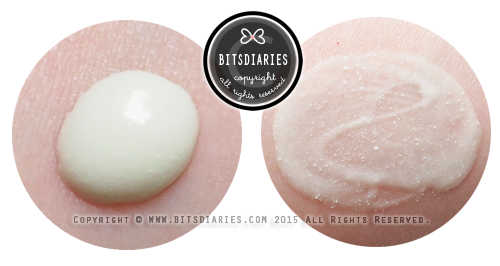 That said, I have to admit that I was worried to try out this Biore's UV Aqua Rich Watery Gel at first. Hahahaha. But I'm glad I gave it a try. I've been using this sunscreen every day for almost a week. So far I haven't experienced any breakouts or irritation. It has a mild and pleasant citrusy scent; however, to be honest, I don't quite like the scent. Upon application, I can instantly feel a cool and refreshing sensation on my skin. It's exactly what it claims to be. What I like most is its lightweight watery texture! Unlike most sunscreens, this feels surprisingly light and goes on sheer, leaving a weightless finish that feels like nothing on the skin. It absorbs quickly which allows me to apply makeup shortly after. In addition, it leaves my skin silky smooth to the touch without greasy or sticky after-feel. 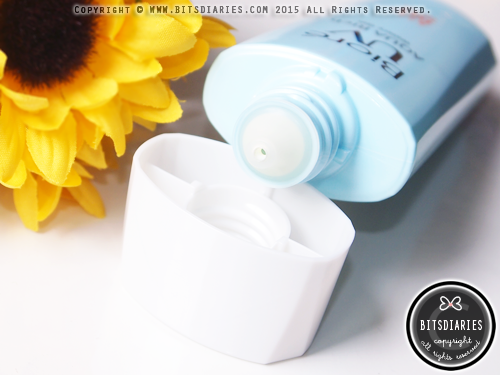 It not only provides ample UV protection to my skin, but it also keeps my skin hydrated! 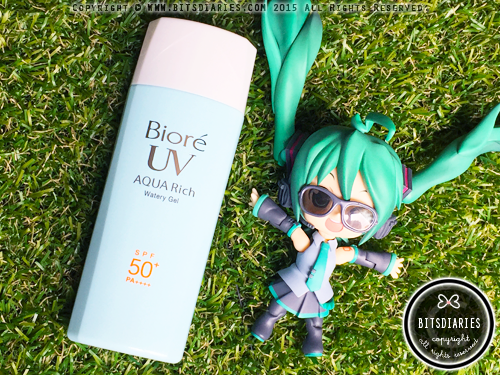 Biore UV Aqua Rich Watery Gel is available at all leading pharmacies, super & hyper markets, departmental stores, beauty stores and selected mini marts, retailing at the price of SGD$18.90. DISCLAIMER: This product was sent to me for review purposes; however, all thoughts expressed are my own.